Spot silver prices ended the silver trading week in a positive mood, with a wide spread up bar which closed well above all three moving averages and just below the $14.75 price handle outlined in Friday’s silver market commentary. However, before before bullish silver traders get too carried away with Friday’s strong performance for the industrial commodity, I felt it would be useful to highlight the pennant pattern which is now forming strongly on the daily silver chart, which is much the same as on the gold chart. The high of Friday was well within the upper boundary of the envelope, suggesting that we will have to continue to wait for any sustained break out from the consolidation of the last few weeks. 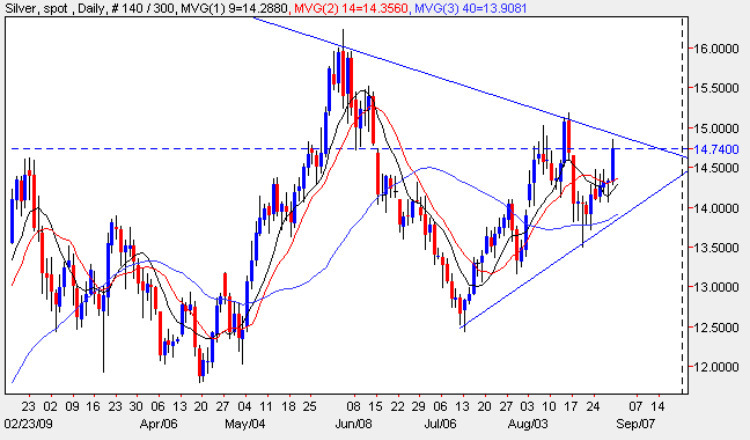 My feeling is that whilst the breakout may well come to the upside in due course, we will have to wait for Labor Day and the start of the new month before a new trend in silver prices is established, and only a break above the upper boundary of the pennant formation will be sufficient to confirm that this technical set up has been breached and we can once again trade the trend with any degree of confidence.